Note: For Hero 5/6, just put it in the case, use it directly. But for Hero 4, you need an adapter, and this adapter is inside the case. - Only for GoPro Hero 4/5/6 action camera, each 0.5w, total 10W,1000 lumens, for diving photography without dead Angle. 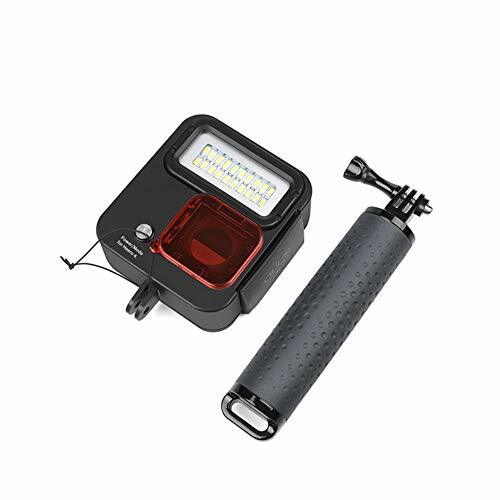 - Perfect for take photo or video at night, diving ,snorkeling or other rayless environment.Waterproof up to 40m(Maximum). - High light mode: PWM output, Frequency, 2.5K,95%. Power saving mode: Frequency, 2.5K,50%. SOS mode: Frequency, 2.5k, 50%, ON: 500ms, OFF:500ms. - Red Filters:Provides color correction while capturing footage in blue water or clear freshwater.